Looking for shrimp recipes? 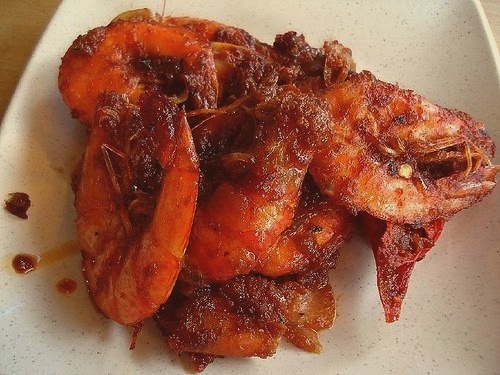 Try this famous hot and spicy prawns in sambal recipe which goes well with Nasi Lemak. This Sambal Udang is easy to cook with step by step instruction in preparing the dish. In a small bowl, break a small chunk of wet tamarind using your fingers, strain, discard seeds, set aside. You should end up with a fairly thick brownish fluid called "tamarind water"
Add prawns, stir-fry until just opaque – do not overcook! Serve with steamed rice or Nasi Lemak.